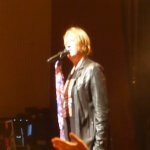 Def Leppard played a show in Canandaigua, NY on 17th July and the first fan videos have been posted online. Fans have uploaded footage from the show which took place at CMAC. These include Joe's speech before 'Rock Of Ages' was played. Joe talked about the band going away to write new material. Read/Watch the full speech below. Watch a video of 'Rock Of Ages' below as posted by paulm. "Thank you very much. Wow. Storming the front of the stage half way through the second to last song it's like the 70s! all over again. Um right then. Let's just have a look I can't see you at the back but I know you're up there. You guys thank you!" "As I said earlier it's the last night tonight we're going home. We're gonna go and do a few bits of business. Write some new songs. If anybody really cares about - would anybody wanna hear some new Leppard songs? The business changes. We'd like to write some if you'd like to hear them. I guess we're gonna have to write some songs then." "Until they're finished however we shall take a little break and hopefully we'll see you guys again next time around cause it's been a lot of fun tonight. So make a little noise please for the boy at the back stand up Rick Allen! OK Rick make some noise for these people." "I think it's worth mentioning that tomorrow is the 35th anniversary of the first gig we ever played. Thanks for being part of the celebrations you guys. Till next time you guys take care of yourselves. We'll see you again one day. Goodnight!"